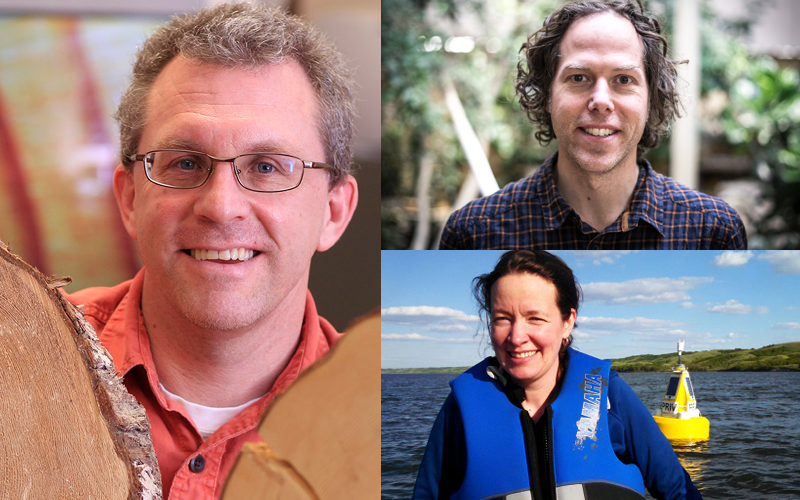 GIWS researchers Colin Laroque (left), Colin Whitfield (top right) and Helen Baulch (bottom right). GIWS researchers receive funding for leading-edge projects to reduce environmental impacts in the agriculture sector. Agriculture and Agri-Food Canada is funding both GIWS projects through the Agricultural Greenhouse Gases program, which supports methods to mitigate greenhouse gas (GHG) emissions and development of on-farm technologies to reduce the farming industry’s GHG footprint. Colin Laroque (soil science, $1.4 M): Development of a management support toolbox for carbon sequestration strategies using agroforestry shelterbelt systems in Saskatchewan: Southern Saskatchewan has 56,000 kilometres of shelterbelt trees that sequester enormous amounts of carbon. But the trend in recent years has been to remove some shelterbelts (350 km between 2008 and 2016) and plant fewer trees on farmland. This research project’s aim is to continue promoting shelterbelt systems as a scientifically sound agroforestry practice, and to develop a management support toolbox for farmers. This can provide producers with portable computer applications for field use that can recommend such things as good planting designs and trees best suited for the location, calculate how much carbon will accumulate in trees under changing climatic conditions, and outline best practices in shelterbelt management. The goal is to increase the retention of existing shelterbelts, and promote adding shelterbelts for on-farm GHG mitigation. This research project investigates the GHG emissions from farm reservoirs that have been touted as a beneficial management practice in mitigating flooding and erosion in wet years, providing scarce water in dry years, and returning environmental benefits in terms of water quality and habitat. Yet these shallow reservoirs also can be critical hotspots for releasing GHG gases, including methane and nitrous oxide (N₂O). This project examines eight agricultural reservoirs in southern Manitoba for their impact on whole-farm GHG emissions. The goal is to assess the importance of such things as controlling nitrogen runoff to minimize N₂O emissions, and to develop recommendations for siting and management of reservoirs to mitigate emissions. The research includes developing novel sensor technology to identify the release of bubbles containing GHGs from reservoir sediment—a pathway of GHG release that has remained poorly controlled.